Although Spearhead's 1994 debut album bore the title Home (Capitol Records), the San Francisco-based band has spent very little time in the Bay Area recently. The group devoted 18 months to relentlessly promoting its first release, then jumped from the tour van to the recording studio for its next record, Chocolate Supa Highway, which perhaps, unconsciously reflects Spearhead's considerable time on the road. stop, Spearhead will embark on yet another 18-month outing for Chocolate Supa Highway, due out in October. While most would tire of the vagabond existence, frontman Michael Franti says the constant state of transience was more inspiring than tiring. "Because of the nature of the lyrics and the group," he explains, "we always have people who come up to us who are down with the consciousness and the community. That gives me a lot of energy to keep going." In touring internationally with a motley mix of bands (R.E.M., Foo Fighters, Fugees), Franti has seen audiences from varied perspectives and locations. And though Spearhead's songs discuss American social issues, the positive political energy moved all audiences. "If you go around the world, you realize that a lot of the issues are the same," Franti says. "Everywhere you go," he continues, "there are people who are down with the consciousness--people who are speakers of truth and battlers of injustice. Everywhere, there are people who live in urban environments, who have suffered under colonialism. It's always a little different how people respond to our music because they come from different cultures, but by the end, people perceive the music in the same way." Forever the awareness activist, Franti creates a kind of hip-hop that is always intellectually provocative without being overbearing or ponderous. As heard on Home, Spearhead offers substance for the spiritual diet with music that illuminates, mesmerizes and dances. "I'm not so much into education as I am into inspiration," Franti admits. "I'm not much into politics; I'm more into having fun, but being in the space where I'm free to have fun." Home earned spots on college-radio lineups, and Franti and Sub Commander Ras I Zulu even hosted MTV's Alternative Nation, but the soul/rap blend blanketed too many disparate genres to get much commercial-radio rotation. Nevertheless, Franti is satisfied with the album's reception. "Home was something that my heart and soul went into," Franti says, "and it was so different than the other hip-hop stuff that I've done. But if you write songs and lyrics that mean something, you're going to find a place in the heart of the people those issues are important to." Most notably, "Positive," a song about HIV testing, is getting spin through Stolen Moments: Red, Hot and Cool, the first hip-hop project dedicated to the subject of AIDS. The song also backs a Red Cross teen-outreach video on HIV and AIDS. The soulful, jazzy elements of Home make it seductive, but Franti says Chocolate Supa Highway is funkier and leans more toward hip-hop and reggae. If Home is a glowing ember in your fireplace, then Chocolate Supa Highway buzzes like a neon light. Franti attributes the harsher, more urban sound of Chocolate Supa Highway to Hyde Street Studios, Franti's new work place, built by Spearhead's sound engineer while the band was on tour. Hyde Street gave the band more time to develop the street-smart sound that Franti had envisioned for the band, and as producer this time around, Franti says he had more creative control. 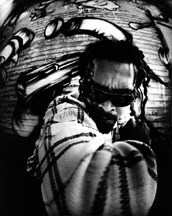 Hyde Street will also house Franti's side projects, such as a record with his old crew, the Disposable Heroes of Hiphoprosy. The album will reflect on the technological and social advancements of the past 100 years. The project will also involve guest artists who have "had something to say in music over the last 20 years." Franti has already discussed the idea with aural activists Chuck D., Rage Against the Machine and Ben Harper. Franti's side project may pay tribute to the past, but with Spearhead, Franti looks to the future. "I have this notion that there's a collective consciousness of the people of color on this planet," Franti asserts "and as we get closer to the year 2000, that brown, chocolate Internet is what is going to help the world move into the future." The Smokin' Grooves Tour featuring Spearhead, Ziggy Marley, Cypress Hill, the Fugees, A Tribe Called Quest, Busta Rhymes and Spearhead takes place Sept. 1 at 6pm at Shoreline Amphitheater, Mountain View.